[none]<br>The new pragraph lo&shy;cation is diff&shy;erent depend&shy;ing on browsers. 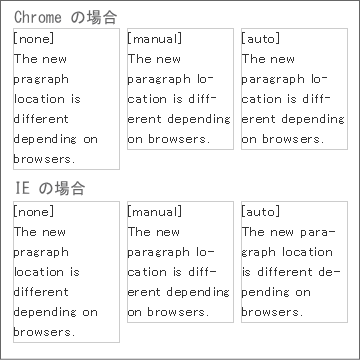 [manual]<br>The new paragraph lo&shy;cation is diff&shy;erent depend&shy;ing on browsers. [auto]<br>The new paragraph lo&shy;cation is diff&shy;erent depend&shy;ing on browsers. The new pragraph lo­cation is diff­erent depend­ing on browsers. The new paragraph lo­cation is diff­erent depend­ing on browsers.